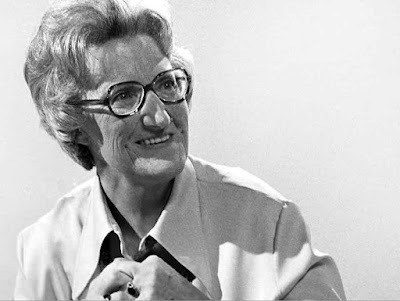 Yes, we have a podcast with Dame Cicely Saunders, the founder of the modern hospice movement. No, it's not one of the GeriPal podcasts, although that would have been a very impressive feat. Rather, Saunders is one of the "castaways" of BBC's Desert Island Discs originally published in 1994, slightly over a decade before her death (click here for the podcast). The format of the show is that guests are asked to imagine they are cast aways on a desert island. They must pick recordings to take with them and discuss the reason why they are bringing them. They also discuss their lives and what they have learned along the way. Saunders discussed her schooldays, how she trained as both a nurse and doctor, the development of St. Christopher's Hospice, euthenasia, and, shocking, how she fell in love with one of her patients. I've had a chance to read a lot about Saunders, but there is something about hearing her voice that really makes recordings like these something very special. Thank you for this! I loved hearing her life story interspersed with her chosen music . . . Also was inspiring to hear about how even though she didn't always fit in, she was creative enough to use her differentness to do so much good.